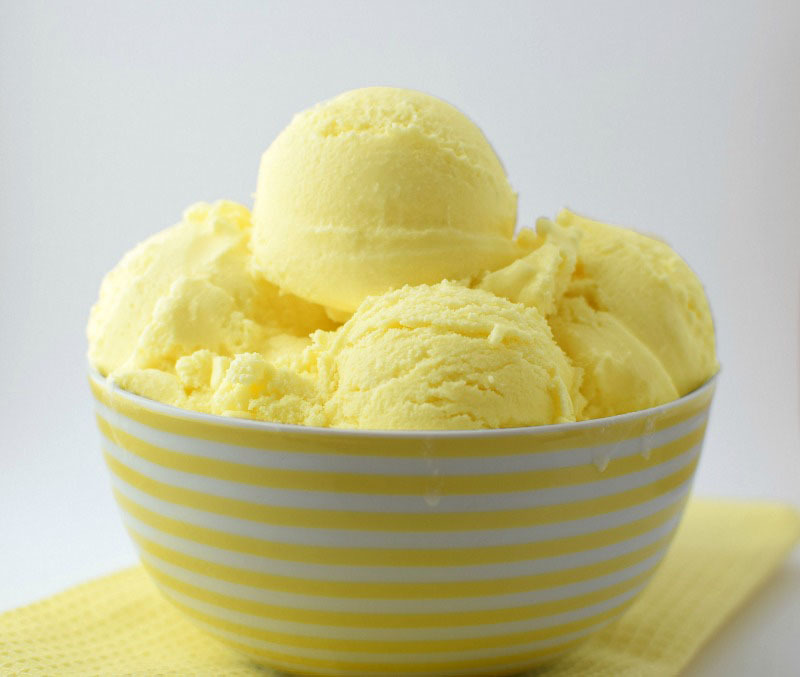 A lemon ice cream recipe that’s an amazing mix of tangy lemon and sweet creamy ice cream. Grab yourself some lemons and get started now! Lemons are responsible for some of the greatest tasting desserts. Lemon meringue pie, lemon cake, lemon pudding, lemon souffle are just a few classics. Now you can add lemon ice cream. I compare this ice cream to lemon meringue pie only creamier and cooler (and better). The best part about recipes that use lemons is that they can be made almost any time of the year. Lemons seem to grow like weeds here in Melbourne and most other parts of Australia. If you can use fresh lemons you’ll get a better tasting ice cream than if you use lemon juice from a bottle. So get down to your local grocer and pick up a bag, or better still, hit up your neighbours for a few from their garden. Do you prefer chunky or smooth? It’s not just a question reserved for peanut butter. When you make this ice cream you have the option to leave the lemon zest in the ice cream during churning for a bit of texture. If you prefer it smooth, use a strainer and remove it prior to churning. Don’t have an ice cream machine? That’s fine. Instead of pouring ice cream base into machine, add straight to the freezer. As it starts to harden, remove from the freezer and whisk until smooth then continue freezing until hard. This method will produce an ice cream that doesn’t have air whipped into it like you’d get by using a machine. But it still produces a tasty dessert that friends and family will enjoy. If you enjoy your ice cream then I recommend you invest in an ice cream machine. It will pay for itself within 6 months easily if you make a lot of ice cream. Also, the quality of ice cream will be much better. Are you currently in the heat of summer where you live? Maybe you’d prefer a really cool sorbet? Try this lemon sorbet recipe which is made for hot weather! Combine lemon zest, lemon juice and cordial in a small bowl and set aside. Scoop out around a cup of milk from the saucepan and slowly pour into the yolks - all the while whisking. Once combined, pour yolks into the saucepan of milk and continue heating on a low heat until it thickens enough to coat the back of a spoon. Pour into an airtight container and stir in lemon mixture. Cool in refrigerator for at least 2 hours until completely cooled. Prior to churning, pour milk mixture through a strainer if you don't like bits of lemon in your ice cream. Churn ice cream as per ice cream maker manufacturers instructions. Add fresh lime juice for an extra hit of flavour. 2 Replies to "Lemon Ice Cream Recipe"